“Guardians of the Galaxy,” the tongue-in-cheek space epic that expanded the Marvel Cinematic Universe, was something of a surprise at the box office. While Marvel had certainly begun making lots and lots of money, the ensemble adventure was something of a test: Could wrap a feature around completely unknown characters — including a monosyllabic tree and an angry raccoon — and still produce a smash hit? The answer, obviously was yes. “Guardians” made $333 million domestically and another $440 million around the world, made stars of its previously anonymous heroes and moved a boatload of merchandise. (It also greatly boosted the Spotify stream counts for a lot of A.M. Gold.) For a while, it was the #3 on the Marvel scoreboard, with only “The Avengers” and “Iron Man 3” grossing more. It was an unqualified smash hit. Its sequel did even better. “Guardians of the Galaxy, vol. 2” kicked off Marvel’s trio of 2017 comedies, grossing $389 million domestic and a global total of $863 million, putting it in the 70 highest-grossing global hits of all time. 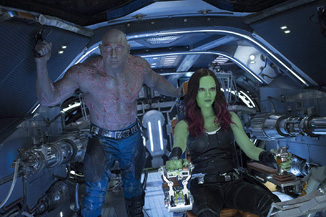 The second adventure of Star Lord, Gamora and crew upped the stakes, complicated the plot and leaned even more heavily into the comedy that made its predecessor a slight anomaly in the MCU. True, all of Marvel’s slate has used humor well, but the first “Guardians” was different; this wasn’t a superhero movie with comedy, it was a superhero comedy. The sequel made that subgenre even more of a priority, with many of the film’s most memorable moments — let’s be honest, Groot trying to find Yondu’s fin is the highlight — being extended gags. It also set the tone for that year’s trilogy of more comedic outings, as both “Spider-Man: Homecoming” and “Thor: Ragnarok” offered similar levels of humor. (“Ragnarok,” especially, is pretty much an outright comedy.) To a certain extent, this full calendar year of comic relief seemed a bit odd at the time; was Marvel just about laughs, now? In retrospect, the motivation is clear: They knew what was coming in the summer of 2018, and wanted us to lower our guards. I’d say it worked.